Are you ready for the penultimate chapter of your life? 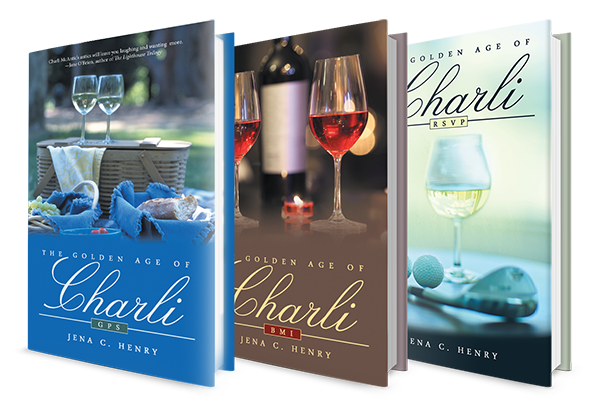 You will be after you enjoy happy hour with the characters of The Golden Age of Charli, a humorous, engaging new series by Jena C. Henry. After 30 years in harness, Charli and Pud McAntic must adjust to the changes that their new retirement lifestyle brings and find their way back into each other’s hearts. Charli’s story begins with The Golden Age of Charli-RSVP, as she stumbles into the Golden Years with a jolt and wonders where the gold, and her husband are hiding. As Jena’s charming heroine, Charli, invites you into her hilarious and heart-warming adventures, you’ll laugh, you’ll cry and you’ll never want the ride to end. And the ride doesn’t end- Charli, Pud, their darling dog and many other friends and family are back in The Golden Age of Charli- BMI. Join the energetic, friendly, and positive McAntics in the second book of the series as they cruise through their retirement years and discover the consequences of too much of a good thing. Be sure to read the third book in the series, The Golden Age of Charli- GPS. Charli is now an empty-nester and is left to recalculate her path to happiness after she and her husband both discover that the golden years are full of more surprises and calamities.